What could be more comforting than a slice of homemade old-fashioned apple pie? This homemade American apple pie is a classic dessert. It can be served either warm or cold, and it’s delicious either way. If the apple pie is served warm, it goes really well with ice cream. This pie can be made one or two days ahead – just store it on the counter, covered with plastic wrap – it still tastes great the next day. 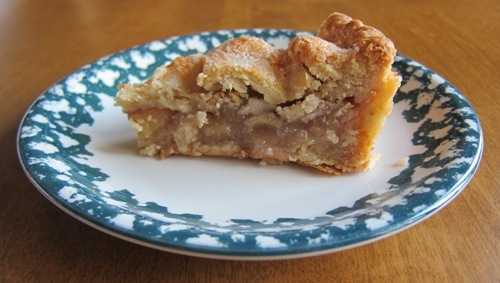 If you want a warm slice of apple pie the next day, just put the slice on a microwave-safe plate and warm it in a microwave. Prepare the dough for the pie crust, shape into 2 disks and refrigerate. Preheat oven to 425F. Spray the 9-inch non-stick round pie pan with non-stick cooking spray. Roll one disk of dough on a floured surface into a 12-inch circle. If the dough is too cold and stiff and hard to roll (it can happen if it’s been in a refrigerator overnight), let the dough disks stand at room temperature for 30 minutes to soften. Carefully lift the rolled dough and put it in the pie pan. Press the dough into the sides of the pan. Some dough will overhang the edges of the pan, and it’s normal. Put the pie pan in a refrigerator while you prepare the apples. Peel the apples and slice into slices, discarding the core. Put the apple slices in a bowl, add sugar, lemon juice, salt, cinnamon, nutmeg and allspice. Toss the apples so they are evenly covered with sugar and slices. Take the pie pan out of the refrigerator. Put the apples in the pie pan. Roll out the second dough disk into an 11-inch circle. Carefully lift it and put it on top of the pie. Pinch the edges of top and bottom crust to seal. Brush the top crust with the egg white and sprinkle with 1 tbsp of sugar. Cut four slits in the top crust. Put the apple pie in the oven. Bake for 20 minutes. Reduce heat to 375F. Bake for another 30 minutes. Remove the apple pie from the oven. It will be extremely hot, especially the filling. Let it cool down somewhat and dig in 🙂 Enjoy your homemade classic American apple pie! 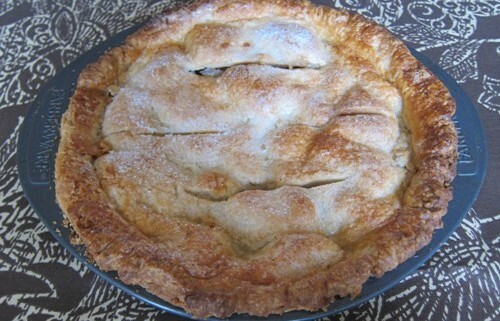 Here’s the picture of a slice of this yummy apple pie! 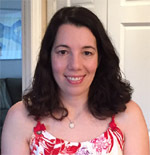 On this picture, the apple pie is served cold. 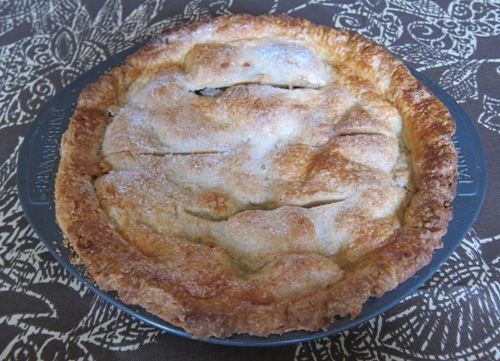 I have always wanted to make an American apple pie and i will start with your recipe! Your apple pie looks delish! Looks delicious. 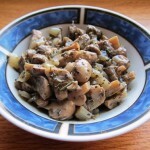 What a great classic recipe. 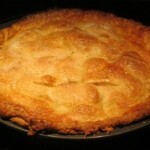 Apple pie is one of our favaourites dessert; great recipe. That’s the best kind of apple pie right there! Not too sweet and nice and simple!